Dates/ Cost: call or check the Baldi Barn Facebook page for updates! 4 Sessions during summer- Call early for a spot! Day Camp runs throughout the year at Baldi Barn. We coordinate with our local school’s vacation dates and also offer camps on some Saturdays. Camp is a magical time to spend on the ranch, with new and old friends alike. 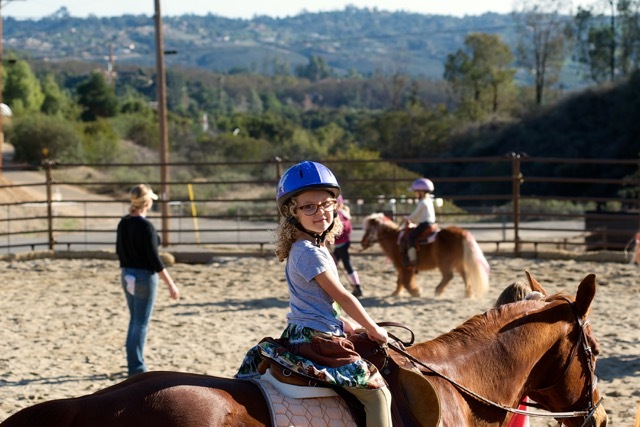 Developmentally appropriate activities, art, and lessons with plenty of riding time sets the stage for camp at “the barn.” It is an opportunity to really bond with horses, hone our horsemanship skills, and get really dirty playing with friends, crafting, singing, and learning. Luckily, in the summer, some of that grime is washed away by swimming! I am a mom (important to list this accolade first), have a B.S. in Health Science, worked and played at some very fine camps in Southern California (Tumbleweed, Camp Lakota), and am a former E.M.T. With this said, please know SAFETY in all of the fun we have is PARAMOUNT! Staff members are well trained and everyone is always under my supervision. We have a thoroughly planned day (even scheduled rest/ free time) so campers know what is expected. Camps are limited to 10 riders so individual attention and instruction is received and no one is lost in the crowd. Spots fill up quickly, especially in summer, so book your children’s place early. 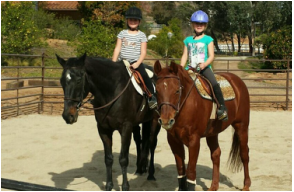 It is an experience your child will look back on fondly and hopefully fuel their love of horses. Campers need to wear long pants, shirts that cover their shoulders, and closed toe shoes or boots. Please bring plenty of water, lunch, sun hat, sunscreen and a helmet. Summer camp also requires a swimsuit and towel. Some helmets are available for use, but for your child’s comfort and health, it is recommended to have your own.